It was a Bloomberg-era castle in the sky, born in secrecy, with Booz Allen Hamilton as the midwife. It was named the Central Library Plan (CLP), and as conceived by the trustees of the New York Public Library, it entailed the removal of 3 million books from the historic shelves beneath the Rose Reading Room at 42nd Street; the subsequent demolition of those shelves; and the insertion therein of a computer and circulating library designed by the British architect Norman Foster. How would the NYPL, which has been in financial distress for much of its history, pay for such a colossal undertaking? By selling two libraries situated on coveted pieces of city real estate: the Mid-Manhattan Library and the Science, Industry and Business Library. The Bloomberg administration, for its part, committed $150 million in capital funds for the project. Opposition spread quickly, for obvious reasons. For one, the CLP was too expensive: the price tag was listed at $300 million, and the NYPL admitted it could run higher. The plan also neglected the needs of the system’s eighty-eight branch libraries (which require at least $500 million in repairs), and it allowed for the desecration of one of New York City’s architectural gems. The pressure and the scrutiny finally became intolerable: on May 7, the library’s president, Tony Marx, canceled the CLP. He made the right decision. It is a defeat for the NYPL’s leadership, which worked aggressively to move the plan across the finish line. Marx was determined to begin construction last summer, while Bloomberg was still in office, but a pair of lawsuits filed by critics became an impediment. Undeterred, in the fall the NYPL paid $25,000 to a well-connected lobbyist whose task was to mobilize the Teamsters, construction unions, clergy and immigrant leaders on behalf of the renovation. Finally, in January the library sent a mailing to city residents, urging them, as it often does, to contact elected officials on behalf of greater library funding. But this mailing was underhanded—buried in the fine print was language supporting the renovation. Three vibrant citizen groups deserve much of the credit for the demise of the CLP: the Committee to Save the New York Public Library, Citizens Defending Libraries, and the Library Lovers League, whose members worked around the clock for more than a year, and whose efforts prompted mayoral candidate Bill de Blasio to oppose the CLP at a July press conference held on the steps of the 42nd Street Library. Micah Kellner, a New York State assemblyman who held a public hearing in June 2013 at which Marx was peppered with tough questions, also deserves credit, as do two outstanding writers: Ada Louise Huxtable, whose stinging Wall Street Journal critique of the CLP in late 2012, “Undertaking Its Destruction,” was written from her deathbed; and New York Times architecture critic Michael Kimmelman, who not only demolished the CLP on the front page of the Times in early 2013 but also kept the issue alive on Twitter and in his regular Times column. While the trustees have lost the Battle of 42nd Street, they did achieve one central tenet of the CLP—the sale of the beloved Donnell Library on 53rd Street, across from the Museum of Modern Art, now the site of a forty-five-story luxury hotel and condominium. The NYPL collected $59 million for the property, a sum that one Manhattan real estate expert described as “suspiciously low.” The tower’s penthouse apartment has been advertised for $60 million. A much smaller NYPL branch library will reopen at the site next year, and the NYPL will spend $20 million to outfit it. The botched, clandestine sale of Donnell—its users were never informed of the deal until the building was about to be shuttered—remains a source of ire to many city residents. Elected officials need to examine the details of that sale. 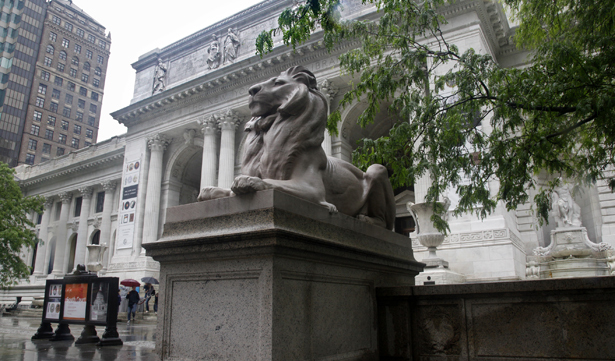 Are the NYPL wars truly over? Four questions need immediate clarification. First, will Marx repair the decrepit Mid-Manhattan Library, or will he let it deteriorate even further so as to sell it down the road under a more developer-friendly mayor? Second, in 2013 the NYPL hastily removed 3 million books from the stacks in preparation for their demolition. The Wall Street Journal has reported that the stacks will remain empty, an unacceptable outcome for a building that was designed as a splendid machine for book storage and delivery. Marx should convene a public meeting in the library’s Celeste Bartos Forum to discuss the future of the stacks and the various alternatives for them. (He must also clarify how many books and photographs were damaged when the stacks were emptied.) Third, Norman Foster has already received $9 million for a design that was partly scrapped—a reckless disbursement of funds from a library system in chronic financial difficulty. Marx has refused to reveal the source of that money. Did it come from the NYPL, or from one or several of its trustees? Last, will the NYPL’s eighty-eight branch libraries, many of which are in poor neighborhoods, now receive the funds they need to flourish? Intrinsic to these questions is the matter of transparency in governance at the NYPL, which is a remarkably closed institution. Throughout the entire controversy, it did not release a single internal financial document about the CLP, nor did it release a cost analysis for the renovation. The NYPL’s librarians were almost entirely excluded from the process, and not a single public meeting preceded the creation of the CLP in 2007. Under state law, the mayor, the comptroller and the speaker of the City Council are obligated to appoint ex-officio representatives to the NYPL’s board. Bloomberg’s representative was his sister, Marjorie Tiven. Mayor de Blasio, Council Speaker Melissa Mark-Viverito and Comptroller Scott Stringer must appoint to the NYPL board independent voices who will bring sunlight to the internal proceedings and citizen accountability to one of the world’s greatest libraries.